A tether anchorage point is provided behind each rear seating position. If you have a child restraint system that comes with a tether but can be installed with a seat belt, the tether may be used for additional security. 2. Route the tether strap over the head restraint. Make sure the strap is not twisted. 3. 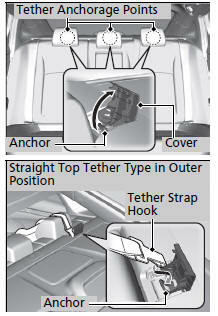 Secure the tether strap hook to the anchor.